The first anniversary celebration of Lenggong Valley as a World Heritage Site was officiated by Regent of Perak, Raja Dr Nazrin Shah. A five-day carnival was held which included an art exhibition, display of traditional dishes from 18 villages, cultural shows and performance by singer Jamal Abdillah who is known as Raja Pop Malaysia. Menteri Besar Dato’ Seri DiRaja Dr Zambry Abdul Kadir said the carnival was to help promote Lenggong Valley and to create awareness among people to appreciate the priceless heritage of the country. The recognition by United Nations Educational, Scientific and Cultural Organisation (UNESCO) on June 30, last year, meant that Lenggong Valley is listed on the world tourism map and is soon to become a popular tour destination for many. This is the fifth site in Malaysia, in addition to George Town, Malacca, Mount Kinabalu and Niah Cave, to be recognised as world heritage site. Zambry added that since the recognition, the number of tourist arrivals had increased from 2,000 to 5,000 per month. This positive increase can be attributed to the recognition and has also opened the door wider for the state’s tourism industry, particularly in Hulu Perak where development will take place. The state government together with the Ministry of Tourism and Culture and National Heritage Department are preparing and developing the tourist infrastructure in Lenggong Valley. However, this may take some time to materialise. The opening ceremony ended with fireworks display. Dato’ Hamidah Osman and her tourism entourage visited Lenggong Valley recently to see things first-hand. Her concerns were the requirements stipulated by United Nations Educational, Scientific and Cultural Organisation in reviewing the valley’s heritage status. A management plan has to be submitted to UNESCO by February 2014. The most pressing issues are sign postings on roads leading to the Lenggong Archaeological Museum and Gallery and the availability of guides who can take tourists to the seven archeological sites scattered around Lenggong Valley. Since acquiring the heritage site status, visitors to Lenggong Valley have doubled. To celebrate the pronouncement, Hamidah proposed an annual week-long fiesta around June 30, the date UNESCO declared Lenggong Valley as a World Heritage Site. Infrastructure up-grading works are required. They range from lodging to transportation and promotion. She hoped the Federal Government could allocate a budget to liven up Lenggong Valley. The valley management committee should comprise representatives from the Department of Natural Heritage, Tourism Malaysia, Tourism Perak, MATTA, and even taxi drivers. This is one tall order but with commitment the ultimate will be realised. A talk on Lenggong Valley recently by Professor Dr Mokhtar Saidin, Director of the Centre for Global Archaeological Research, USM, received a very good response from government authorities and tourism stakeholders. Lenggong Valley was declared a UNESCO World Heritage site in June this year for having evidence of human occupation from 1.83 million years to 1000 years ago, one of the longest prehistoric sequences in the world. At the Q & A later Mokhtar stated that an integrated management plan for the preservation of Lenggong Valley has been initiated and has to be submitted to UNESCO by 2014. A committee has been established to draft the plan headed by the National Heritage Department who is working together in close collaboration with the State, Lenggong District Council and Town and Country Planning Department. 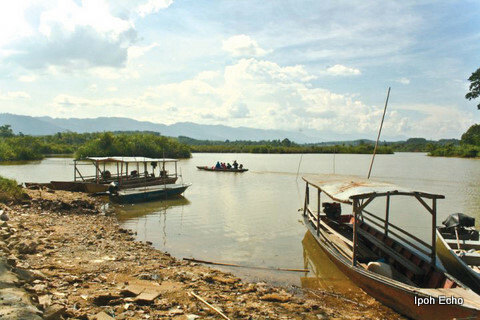 The Management Plan will look into all aspects of managing Lenggong Valley such as conservation and preservation, the dos and don’ts about conducting tours at an archaeological site as well as tour packages. Failure to submit the plan can place Lenggong Valley in danger of having its World Heritage Status revoked by UNESCO. Currently the Lenggong Galery is being renovated to house the World Heritage Office. Lenggong Gallery already has its gallery of up-to-date exhibits of the whole valley, a service counter, brochures and in time to come tour packages. A current concern is the lack of tourist guides. Currently 20 are being trained and are due to receive their badges later this year. On the June 10, the New Straits Times reported that the Perak government wants Lenggong Valley to be declared a world heritage site. It quoted the Menteri Besar Dato’ Seri Dr Zambry Abdul Kadir saying that the United Nations Educational, Science and Cultural Organisation (UNESCO) had done an assessment of the area and that it had potential, especially in terms of world history. It further reported that, “According to UNESCO, the Lenggong Valley is one of the earliest sites of world civilisation which dates back more than 180 million years”. There can be no dispute that amongst the attractions in Perak the Lenggong Valley archaeological sites are in a class of their own. They have the potential, as Dr Zambry claimed, to put Perak on the world map. Having said that, I need to impress that if we are to succeed in establishing and promoting this area as an important archaeological site we need to become more knowledgeable about archaeology in general and the area in particular and deliver accurate information. Only then can we be perceived as credible. Grossly inaccurate statements like that attributed to UNESCO that the “Lenggong valley civilisation dates back more than 180 million years” has to be avoided. I do not know if UNESCO actually said this but I seriously doubt it. Suffice it to say that 180 million years ago dinosaurs were still wandering around the earth and mammals, let alone man, existed in ferret-like form and this region, if it existed at all, was part of the supercontinent Pangaea. Current evidence supports the theory that modern man (Homo sapiens) left his place of origin in Africa only about 100,000 years ago. He probably arrived in the Lenggong valley about 80,000 years ago. However, there is evidence that the ancestors of modern man (Homo erectus or descendants) possibly resided in the Lenggong valley 200,000 years ago. Even if this specie were considered human we are still talking only about 200,000 years, and 180 million years is more than a little exaggeration. I can only hope that it is the New Straits Times that erred, substituting million for thousand. If that be the case, the Chief Minister’s secretary should have been diligent enough to correct the mistake within a day or two of its publication. Is The Intent Research Or Tourism? I do not know if the intention is to promote this site for research or as a tourist destination. If the intent is merely to employ the site for research I do not think much benefit could be derived by gaining recognition from UNESCO as a world heritage site. We will only succeed in subjecting ourselves to restrictions imposed by a third party. If, on the other hand, we are talking about promoting the site as a tourist destination, I am puzzled by the fact that it appears to be missing in the Perak tourism master plan prepared by the consultant from New Zealand engaged by the State Government. It is unfortunate that there appears to be a singular lack of coordination amongst those directing tourism. If we are really serious in promoting the Lenggong valley as a tourist destination, a separate body needs to be set up to single-mindedly focus on this product. It could be modelled on the Perak State Parks Corporation. At the moment, save for the museum, which I must say is well designed and the artefacts well presented, the archaeological sites are not easily accessible and more importantly not ready with infrastructure to not only support visitors but safeguard the integrity of the sites. Rules and regulations need to be devised and strictly enforced to ensure that the value of the sites is not compromised in any manner. If this is not done we will only be inviting disaster. Prof. Zuraina says archaeology is much more than artefacts. It is the study of human culture and the process of its evolution. It is the study of how societies evolved and civilisations developed in a complex, dynamic and changing process, influenced by a range of factors including the environment, contact with others, population increase and changing needs. This vision presents almost unlimited prospects for creating tourist attractions based on the history of the Lenggong valley. One possibility I can immediately think of is creating a sound and light show at a suitable site in the area. Bringing the history of the valley to life in this manner will provide tourists an exquisite experience of prehistoric Lenggong.